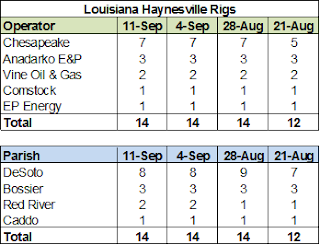 The Haynesville Shale rig count is at a new low since I started compiling the data in 2010, dropping three over the past two weeks to 17. Louisiana was down two to 12 (Chesapeake and EP, each down one), while Texas was down one to five (XTO). 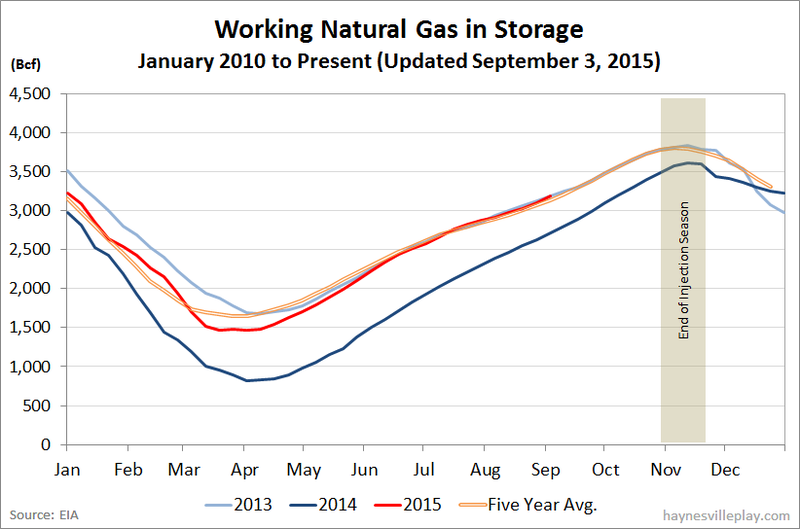 The EIA reported this morning that working gas in storage was up 106 Bcf last week to 3.44 Tcf. The weekly injection was 10% above last year (+96 Bcf) and 28% higher than the five year average (+83 Bcf). The current storage level is now 15.7% above last year (2.974 Tcf, a difference of 466 Bcf) and 4.5% above the five year average (3.292 Tcf, a difference of 148 Bcf). The Baker Hughes U.S. rig count was down six this week to 842. Oil rigs were down eight to 644 and gas rigs were up two to 198. By type, horizontal rigs were down eight to 640, vertical rigs were unchanged at 119 and directional rigs were up two to 83. Among gas rigs, horizontal rigs were up one to 147, directional rigs were down four to 33 and vertical rigs were up five to 18. The EIA announced this morning that working gas in storage was up 73 Bcf last week to 3.334 Tcf. The weekly injection was 19% below last year (+90 Bcf) and in line with the five year average (+75 Bcf). The current storage level is now 15.8% above last year (2.878 Tcf, a difference of 456 Bcf) and 3.9% higher than the five year average (3.209 Tcf, a difference of 125 Bcf). The Haynesville Shale rig count didn't budge last week, holding at 20. Louisiana stuck at 14, while Texas held at six. 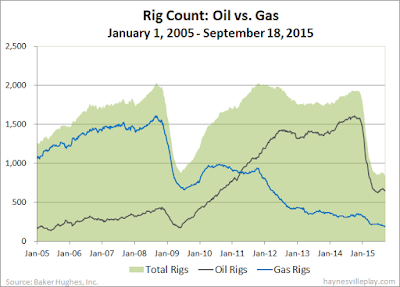 The Baker Hughes U.S. rig count was down 16 to 848 this week. Oil rigs were down 10 to 652 and gas rigs were down six to 196. This is the first time in the BHI count data (compiled since July 1987) that the gas rig count has dropped below 200 (and annual production keeps increasing!). By type, horizontal rigs were down 11 to 648, vertical rigs were down one to 119 and directional rigs were down four to 81. Among gas rigs, horizontal rigs were down five to 146, directional rigs were down two to 37 and vertical rigs were up one to 13. The EIA announced this morning that working gas in storage was up 68 Bcf to 3.261 Tcf last week. The weekly injection was 24% below last year (+90 Bcf) but 8% higher than the five year average (+63 Bcf). The current storage level is now 17.0% higher than last year (2.788 Tcf, a difference of 473 Bcf) and 4.1% above the five year average (3.134 Tcf, a difference of 127 Bcf). The Haynesville Shale rig count was down two last week to 20. Louisiana held at 14, while Texas dropped two (Anadarko and BP) to six. Last week marks the first time since the summer of 2011 that Anadarko hasn't operated a rig in the Texas side of the Haynesville Shale. It now runs three rigs in Bossier Parish, LA. Speaking about battling the buck, Comstock had a run in with the buck back in July, closing at $0.99 on August 4. The next day, the company released its quarterly earnings, reporting on successful wells in the Haynesville Shale, and the price has subsequently tripled over the past month (probably abetted by investors noting some insider purchases). The Baker Hughes U.S. rig count was down 13 to 864 this week. 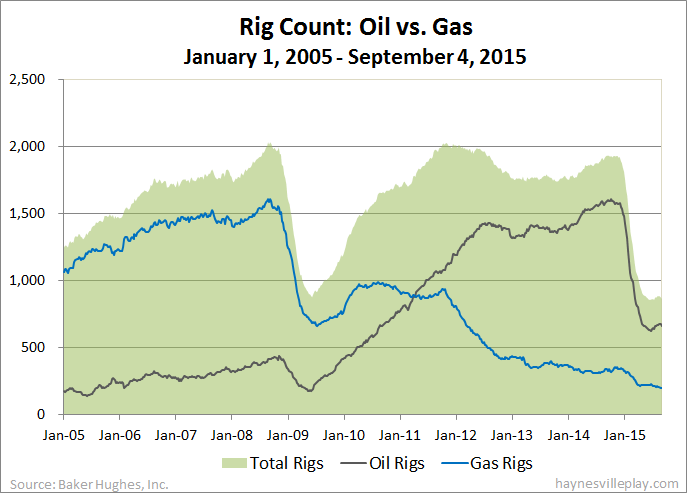 The entire net change was in oil rigs, which dropped 13 to 662. Gas rigs were unchanged at 202. By type, horizontal rigs were down 13 to 659, vertical rigs were down five to 120 and directional rigs were up five to 85. Among gas rigs, there was no net change (horizontal = 151, directional = 39, vertical = 12). The EIA reported this morning that working gas in storage was up 86 Bcf to 3.193 Tcf. The EIA reclassified some of last week's results to get to the 86 Bcf implied flow. In any case, the weekly injection was substantial: it was 9% above last year (+79 Bcf) but 43% greater than the five year average (+60 Bcf). The current storage level is now 18.3% above last year (2.698 Tcf, a difference of 495 Bcf) and 4.0% above the five year average (3.071 Tcf, a difference of 122 Bcf). In intraday trading today, EXCO finally broke above a buck for the first time in two months (but faded later...). The company had received notice from the New York Stock Exchange exactly a month ago that it would be delisted from the exchange if it didn't start trading above $1 within 90 days. EXCO got down in the 50 cent range before rallying to get to this point. If this progress continues and it can stay above a buck, the company may avoid having to do a dreaded reverse stock split. Goodrich Petroleum, however, went below the buck in late July and has not yet resurfaced. This week, the company received a similar notice from the NYSE that it is in danger of being delisted. Given EXCO's progress, there is hope for Goodrich.